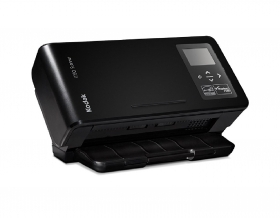 KODAK i1190 Scanners are dedicated desktop transaction processing tools for business. Compact, fast, and quiet, they accelerate workflows to increase productivity. Easily integrated with software and enterprise applications, they can scan, capture information, and extract and share data with the business apps you use every day. i1190 Scanners are the ideal scanning solution for a wide range of applications including banking, finance, insurance, healthcare, and government. KODAK i1190 Scanners integrate seamlessly into a wide range of environments, including WINDOWS, MAC, and LINUX Operating Systems. They also provide TWAIN, ISIS, and LINUX driver capability with business applications. Integration with other software and systems, built-in barcode reading, and easy to use Smart Touch technology, means your scanner can send information to the right places and people automatically and complete common tasks with the push of a button, freeing you up to focus on other projects. The intuitive digital display shows the number of documents scanned or paper ready status, and lets you apply custom activity names and include color icons to make scanning tasks easy to select.